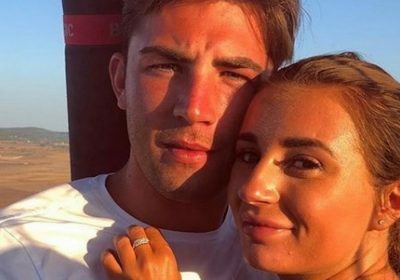 Dani Dyer has moved into a pwoper gaff with boyfriend Jack Fincham – down the road from her old man. They won’t be far from the prying eyes of EastEnders star Danny as daddy’s girl Dani and Jack set up home in a £650,000 house in Essex. The Love Island couple have been proudly showing off their new three-bedroom home on social media, with Dani posing on a sofa and Jack pictured in the kitchen. It’s thought the couple are paying almost £2,000 a month in rent. Currently on holiday in Thailand, they brushed off any suggestion their relationship was on the rocks earlier this year. Dani, 23, was said to be furious after Jack, 27, confessed to taking cocaine. After coming clean, he has vowed never to take it again. “I’ve made a mistake and I’m sorry for it and that’s the truth,” he says. He made his confession during a call to Dani while she was on her Comic Relief trip hiking up Mount Kilimanjaro last month. The former pen salesman said he was dreading facing up to Dani’s dad, who regularly delights revellers by using his phrase “Pwoper gaff” when making personal nightclub appearances.